This machine is suitable for P.V.C., T.P.R. foaming & unfoaming material, T.P.U. & T.P.E. 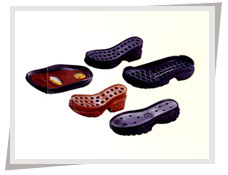 to produce high-level shoe soles. Feeding screw special design with high efficient hydraulic Motor can feed material smoothly and quickly. Full computer P.L.C. control system can set the different injection capacity base on the products' styles & sizes. Also with the logical hydraulic system, it can set the injection pressure & injection speed in the different station. Cylinder with strong mold clamping design has high mold clamping force and can produce one piece or two pieces soles at the same time .This increases the production & decreases the cost. Mold cooling uses water cooling type to make better pattern results and steady quality in products. Special injection device can be suitable for mold top injection and mold side injection. Its range is unlimited to increase the machine functions. Automatic monitoring system and broken-down display system, the need maintenance point can be indicated clearly and quickly. Even an unskilled worker can operate and maintain the machine easily. Disc control by hydraulic transition system and monitor with computer automatically. It makes the disc turn fast and set accurately. In the automatic open mold system & vacuum autoloader system, only need one person to operate it. This can decrease the production cost.